It is the mission of Baxter Academy for Technology and Science to offer STEM education opportunities to as many young people as possible. 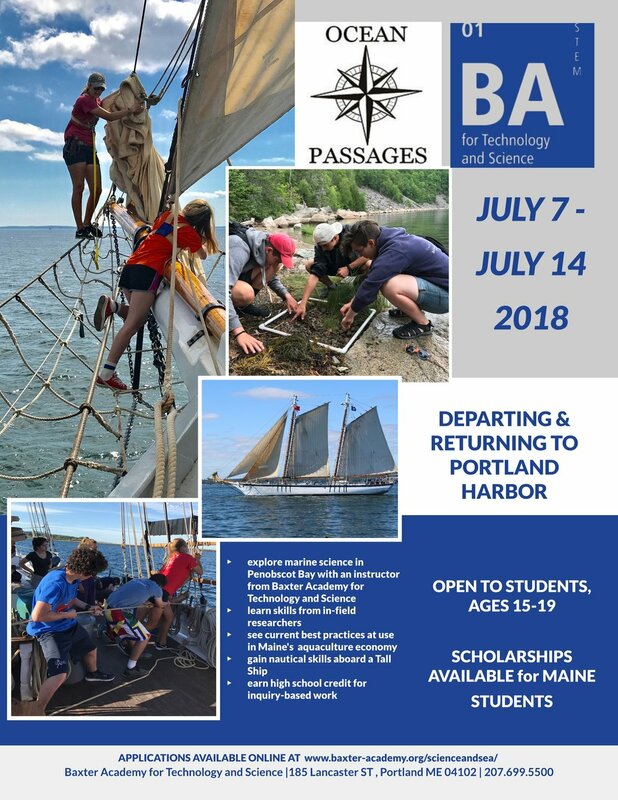 We also believe in real world learning, which is why we are partnering with Ocean Passages to give you Science & Sea, a two week academic and nautical intensive. Each student will select an area of research that highlights economical and ecological ocean sustainability. While aboard the Harvey Gamage, students will be given the content knowledge and resources necessary to engage with professionals working in aquaculture along the Maine coast. Students will work alongside a Baxter science instructor and earn academic credit for their research. In addition to academic rigor, students will engage in the intensity of working as a team to sail the Harvey Gamage. Under the guidance of captain and crew, students will learn nautical skills such as chart reading and navigation, sailing terminology and technique, as well as the everyday maintenance and upkeep of working and living on a tall ship. Previous boating experience is NOT necessary. Tuition is $1225 and includes all meals, lodging, and general trip supplies. Students will provide their own personal clothing, footwear, and foul weather gear. Scholarships are available for Maine students. See application link below. The Harvey Gamage will depart and return to Portland Harbor. Download the application here. Questions about the program or application process can be directed to our Partnership and Outreach Coordinator: heather.dippolito@baxter-academy.org.